Last week we made sure to polish our shoes and iron our shirts, as we had the honor of welcoming King Willem-Alexander, his wife Queen Máxima as well as their accompanying delegation from the Netherlands. During their visit to Leipzig they focused on the topics of energy, living, and economy. In sticking with this theme, they also made sure to stop by our start-up accelerator. After the royal couple was greeted with a welcome speech by the Saxon Minister President, Stanislaw Tillich, the couple split up to get a better look at the individual start-ups at SpinLabs. Followed by a crowd of journalists, photographers, and television cameras, Queen Máxima came to visit our workplace. The Dutch Queen observed us for about 10 minutes. After listening to a short presentation, Her Majesty then went on to ask questions on the state of our development, future products, and our target group. We've had a fun time reminiscing about the visit and who knows: perhaps the Dutch royal family will soon be sporting a few wallets and bags from poqit.berlin. What can you expect for 2017? We were able to make the most of the time we spent in our accelerator in Leipzig. The program is set to end in March; then we’ll finally be ready to enter the market with poqit. For this reason we're working hard on our market launch. Be sure to sign up for our newsletter if you want to take advantage of our exclusive early bird price! 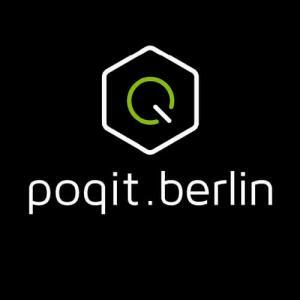 Kind regards from Marko and the poqit.berlin team.